Since we went to Disneyland the other day, I was reminded of this recipe. I have no idea where the name for "Disneyland Chicken" came from. All I know is that this is my sister's recipe and it is good. The end. Preheat oven to 350 degrees. Place chicken breasts in a glass baking dish, skin side up. Combine the rest of ingredients in a large bowl and mix well. Pour the sauce over the chicken and bake for 30 minutes. 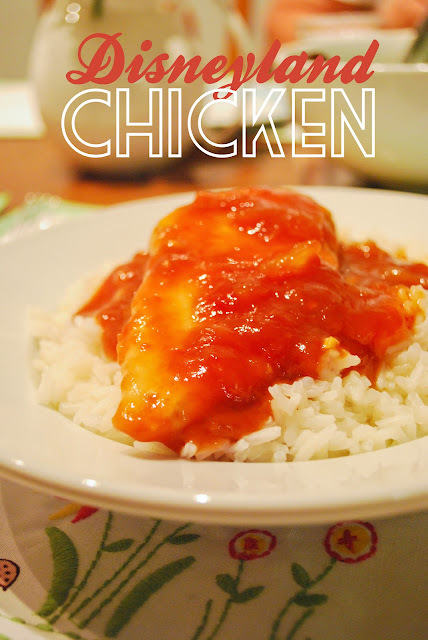 Serve with extra sauce and steamed rice. this looks delicious... and not too tough to make! Years ago, our older sister Diane ate at a restaurant at Disneyland (can't remember the name because it's not there anymore... it was the only other sit-down place besides Blue Bayou) and had this chicken dish she really liked. She asked the server what was in it... the server asked the chef and he came out and talked to her! She was very surprised, but the chef was eager to tell her what was in his creation. She wrote it down and brought the recipe home. But years went by and she never tried to it. Then one day several years ago she gave it to me and I had the guts to try it. It was a hit and it became a family favorite. Naturally we call it "Disneyland Chicken," which is a great name, but it doesn't describe it. If I named it something descriptive, I think I would call it "Sweet & Sour BBQ Chicken." I made this tonight & it was a hit with my husband & 2 y/o daughter. I think the name suits it perfectly. It has a delicious retro flavor & is already a family favorite! What does it mean by 1/4 cup orange juice concentrate? Hey Elizabeth, what does it mean by orange juice concentrate? Just 1/4 cup orange juice? ?